Budapest, 13 June 2016: Greenpeace Hungary, MTVSZ/Friends of the Earth Hungary and Protect the Future (Védegylet) welcome the parliamentary resolution on the free trade agreement. The organizations call attention to the fact that this decision basically says no to the EU-Canada Comprehensive Economic and Trade Agreement given that the Agreement includes an investment court system which is anti-democratic. They urge the government to turn to the European Court of Justice to determine whether such an Investment Court System is compatible with European law. It is by an overwhelming majority (178 for, 5 abstentions, 2 against) that the Hungarian National Assembly adopted a resolution today  on the requirements for trade and investment agreements of the European Union with third countries. 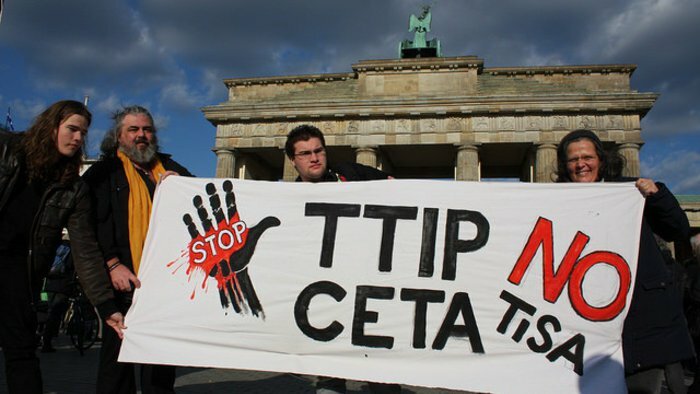 A key provision of the resolution urges the Government to firmly and consistently stand for the position that neither the proposed EU-US free trade agreement (TTIP) nor the EU-Canada free trade agreement, (CETA) about to be signed can come into effect unless formally endorsed by parliaments of EU Member States. Today’s parliamentary resolution represents an important advance in the growing debate on the transatlantic free trade agreements, as it states that the Government must not support the adoption of a free trade agreement that would undermine exisiting standards in the various fields of environmental protection, health, food security, human rights and labor law, and that would at the same time include anti-democratic dispute settlement procedures, stressed Balázs Tömöri, Campaigner for Greenpeace Hungary. This also means that the Government must say no to the EU-Canada Comprehensive Economic and Trade Agreement (CETA), as it also includes the anti-democratic Investment Court System that would allow Canadian-based companies to sue our country as well as other EU Member States, while CETA would also endanger our country’s GMO-free stance - emphasized Újszászi Gyorgyi, the Secretary-General of Protect the Future (Védegylet). As demonstrated by the analyses presented at the conference organized jointly with the Office of the Commissioner for Fundamental Rights last week, the Investment Court System (ICS) which is planned to be included in TTIP and is already part of CETA is incompatible with European law. Therefore, we continue to urge the Government to turn to the European Court of Justice and solicit the Court to assess the legality under European law of the Investment Court System - added Róbert Fidrich, program manager of MTVSZ/ Friends of the Earth Hungary.